Nebraska, you know we love you. All these years whipping across your big ol’ prairie…all the nights in Kearney, Grand Island, Oglalla, Lincoln and Omaha…and we finally made a poster dedicated to Nebraska! That’s what you are seeing above. 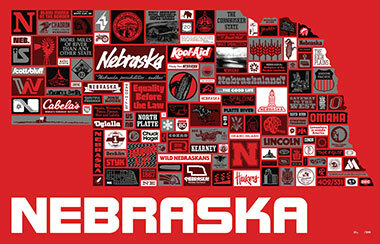 Compiled from years of collecting logos, stuff, things and what not from our experiences in and through Nebraska. Dipped in “Cornhusker Fan Frenzy” red and white. Dig it! Get it going, Nebraska! 02. Four colors! Inspired by a Cornhusker t-shirt I had in the mid-’90s. 03. 18” x 24”! Big and beefy, like Nebraska cattle. 04. Proudly printed by the magicians of The Half And Half down south! 05. Cornfield or kernel? Get in close here: Miles and miles of prairie to wonder about. 06. Just the right addition to that Omaha Woodmen building office, Saddle Creek records shipping station, The Waiting Room “wall of awesome”, Grand Island truckstop shitter, Yankton sod house, Kearney halfway house, Lincoln basement design studio, Scottsbluff jail cell, Missouri River lean-to and Chadron dorm room. Just what you need, Nebraska! 07. Dedicated to Jim, Bev and Mike Styskal, and, Schmidt.